TIFFIN, OHIO NOVEMBER 21, 2018– The YMCA of Bucyrus-Tiffin announced today that Charles “Buster” Ardner will serve as the new Chief Executive Officer, effective January 14th. He will succeed Steve Crone who served as CEO for 10 years and left at the end of July. Buster Ardner currently serves as Assistant Vice President for Finance and Auxiliary Services at Tiffin University, a position he has held since 2011, and has more than 20 years of experience in not for profit administration. He has also served 14 years on the Tiffin YMCA Board. His impressive track record of executing significant initiatives that seek to improve Tiffin University and his dedication to volunteerism with the YMCA make him an ideal choice to lead the YMCA of Bucyrus-Tiffin. Ardner was chosen in a national search, conducted in part with Y-USA. A six-member search committee, composed of YMCA board members and Y members representing both Bucyrus and Tiffin, chose Ardner after an in-depth, six-month search process. Ardner earned his Bachelor of Business Administration and Master of Business Administration at Tiffin University. The mission of the YMCA of Bucyrus-Tiffin is to put Christian principles into practice through programs that help healthy spirit, mind and body for all. With a focus on youth development, healthy living and social responsibility, the Y nurtures the potential of every youth and teen, improves Bucyrus and Tiffin’s health and well-being and provides opportunities to give back and support neighbors. The Allen Eiry Senior Center is a social organization that provides and promotes activities for those in and around the Seneca County community. Programs aim to benefit the health, educational, social and recreational interest of the community. It is a private, non-protif organization funded by Tiffin-Seneca United Way, The Columbus Foundation, membership dues, grants, special events, and friends of the organization. Named for Allen Eiry, the center honours his support in assisting seniors in the community. Since 1983, the Allen Eiry Fund has benefited the citizens of Seneca County to honour the wishes of Mr. Eiry. A native of Seneca County, Mr. Eiry operated an automotive dealership in Green Springs, Ohio for more than 40 years. A member of the Seneca County Farm Bureau and the Green Springs Masonic Lodge, Mr. Eiry’s ties to the community long succeeded him, having provided over $2.8 million to senior citizens. Membership forms can be found online or at the center. Dues are $25 per person, paid annually from January through December. Members can participate in scheduled activities geared towards their interest, with a wide range of entertainment including bingo, potlucks, and live music. Seniors are encouraged to enjoy a full schedule of social activities, or meet friends at the center all on their own time. Health screenings and flu shots are regularly provided, allowing seniors to monitor their overall health. The Allen Eiry Center prides itself on its ability to provide activities that encourage an active lifestyle in order to maintain a happy and fulfilled lives. The Tiffin City Schools Business Advisory Council is sponsoring a job fair on March 10 at Tiffin Columbian High School. The primary purpose of the fair is to assist high school seniors who don’t plan to attend post-secondary classes in the fall. It is also an opportunity for those who do plan to continue their education to learn about employers who will have a need to hire individuals with the skills they will be learning. In addition, this event will get 8th graders thinking about their futures and give them the opportunity to learn about local career opportunities and the skills and education they will need to succeed. There is space for approximately 50 tables and to date 30 Seneca County employers have responded to express an interest in attending. To reserve a table, contact Pat Smith at Tiffin City Schools at 419-447-2515. Students should bring a resume and be prepared for a brief introduction interview. Have plans to implement the STRIVE program for high school students at risk to not graduate (Coordinated with the Tiffin Rotary Club). The Seneca County Land bank received over $4 million in Neighborhood Initiative Program funds to demolish blighted houses in the county – $4,025,000 to be exact. Seneca County was one of the highest funded counties which speaks highly to the quality of the project, the application and the partners involved. Currently, the Land Bank has identified 161 properties throughout the county for potential demolition with this award. This allocation was made possible because of the large number of partners, including (but not limited to) the Seneca County Commissioners, the Seneca County Treasurer’s Office, the Seneca County Prosecutor’s Office, the City of Tiffin, the City of Fostoria, and the Fostoria Economic Development Corporation office. Seneca County formed the Land Bank in November of 2015 by resolution of the Seneca County Commissioners. A Land Bank is a tool used to strategically acquire properties, return them to productive use, reduce blight, increase property values, and improve the quality of life for county residents. The formation of the Land Bank demonstrated our elected official’s commitment to healthy, sustainable community redevelopment within Seneca County. The Seneca County Land Bank will begin acquiring the identified properties and demolition activity will then follow. This will be an ongoing process but will directly impact property values, safety and even community pride. 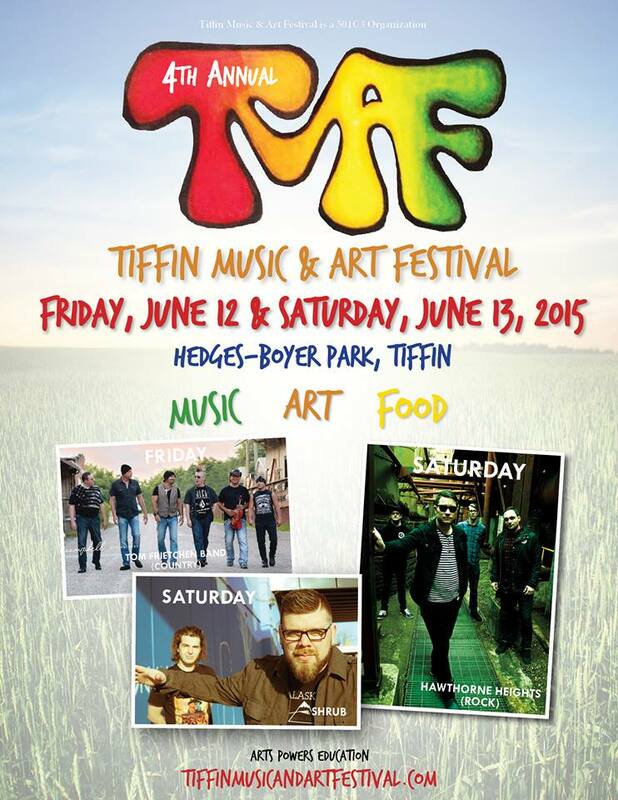 This weekend, June 12-13, the fourth annual Tiffin Music and Art Festival will be held at Hedges-Boyer Park in Tiffin. This year will be the biggest yet, with 73 performances scheduled on five outdoor stages, a beer garden, vendors and workshops, and tons of events for children and adults. Headliners are the Tom Frietchen Band on Friday, and Shrub and Hawthorne Heights on Saturday. Also new this year is the TMAF Scholarship, which will provide $500 each to at least two Tiffin area high school seniors planning to pursue education in performance or visual arts. Proceeds from the event will go toward funding the scholarship. Founded in 2013, the Tiffin Music and Art Festival is a non-profit event staffed by community volunteers. It was created to raise awareness for the arts in the greater Tiffin area and benefit the surrounding community. Events and attractions for children and adults have included live music, fire performers, magicians, clowns, food vendors, glass blowing, a wide variety of workshops, an interactive ice cream stand, interactive kids’ zones and bouncy inflatables. Festival admission is free, however there is a charge for access to the beer garden. Check out the video below for more information about this year’s Tiffin Music and Art Festival.